Roxanne Trunnell and Nice Touch. Photos copyright SusanJStickle.com. 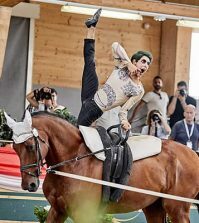 CAEN, NORMANDY, August 29, 2014 – To be selected to represent one’s country at a world championships is an honor that few riders ever experience. To not only compete but to perform well enough to advance through the rounds of competition to qualify for the finals is a rare achievement, indeed. 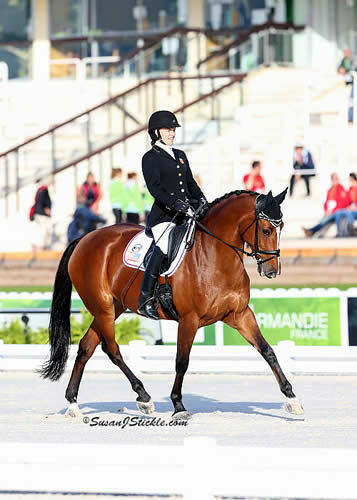 Not one but two U.S. representatives in the 2014 Alltech FEI World Equestrian Games™ para-equestrian dressage competition claimed that achievement today: Roxanne Trunnell, Grade Ia rider; and her WEG teammate Rebecca Hart, Grade II. 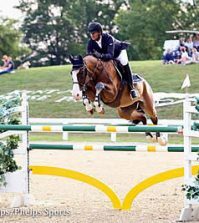 For Trunnell, 29, of Rowlett, Tex., today’s freestyle aboard the nineteen-year-old Dutch Warmblood mare Nice Touch was a high note in several ways. 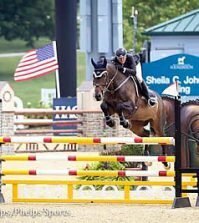 For one, this is Trunnell’s first time on a U.S. equestrian team. 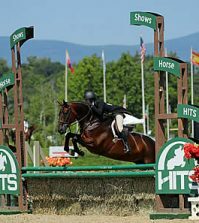 For another, it was the ride of a lifetime aboard the horse she’s been paired with since Trunnell was 13. And to top it off, this was Nice Touch’s swan song. Trunnell was proud of her freestyle routine, appropriately set to George Gershwin’s “An American in Paris” and to music from the musical Gigi, including “Thank Heaven for Little Girls.” The highlight, she said, was Nice Touch’s relaxed free walk, which helped the pair earn a score of 62.400 percent for a seventh-place finish. Schedules are tight for the para-equestrian dressage athletes: Trunnell returns home tomorrow, Saturday, which unfortunately leaves her no time for sightseeing in France. But “I’ll be back,” she said. The 2014 U.S. WEG para-dressage team veteran, Rebecca Hart, 30, of Unionville, Penn., found herself in the position of showing her new mount, Schroeter’s Romani, the ropes of international competition. 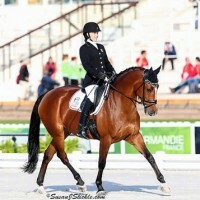 The twelve-year-old Dutch Warmblood mare “was definitely enthusiastic” in her Grade II Freestyle, Hart said with a laugh, referring to occasional tension and loss of focus that left the 2014 United States Equestrian Federation Para-Equestrian Dressage national champions with a score of 65.400 percent and seventh place. The WEG was the debut performance of this freestyle, said Hart. Freestyle choreographer Marlene Whitaker helped Hart put the routine together – but according to the rider, it was Schroeter’s Romani who approved the music selection. With the 2014 WEG, the young U.S. para-equestrian dressage team has taken a major step toward the medal podium on the international stage. It will be exciting to follow this talented group of horses and riders as they proceed on their journey. 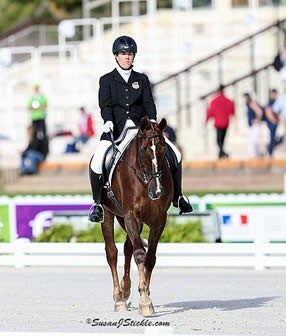 Learn more about the Para-Dressage discipline at the 2014 Alltech FEI World Equestrian Games™ in Normandy, France: http://www.normandy2014.com/the-disciplines/8/para-dressage. Support the Team and its future to the 2016 Paralympics in Rio with the USET Foundation’s Jonathan Wentz Memorial Challenge: http://uspea.org/the-jonathan-wentz-memorial-challenge/. Learn more about the U.S. Para-Equestrian Dressage discipline or give a tax-deductible donation to support the development of the sport with the USPEA 501(c)(3)t: www.USPEA.org.